Description Black and White photograph mounted on cream card. Staff of W.B. Girling, retirement of Mr Griffen, August 1947. 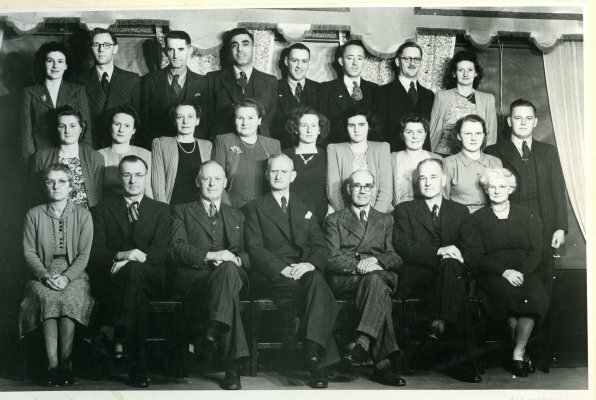 Back row: Lorna Johnston; Edgar Lazarus; Sid Verry; L. Peters; Noel Daines; Bill Knight; Peter Griffen; Nancy Thomson. Middle Row: Shirley Brooks; Gwenda Bishell (nee O'Leary); Reta Patchett; Della Davies; Nancy Daines (nee Gill); Julie Hoult; June Brooks; Ruth Garnham; Eric Gibbons. Front Row: F. Shea; Gerald O'Neill; W.J. Girling; ? Griffen; George Matheson*; Horace Rush; Mary Binley. *spelling of Matheson may not be correct.